Today's busier, faster society is waging an undeclared war on childhood. With too much stuff, too many choices, and too little time, children can become anxious, have trouble with friends and school, or even be diagnosed with behavioral problems. Now internationally renowned family consultant Kim John Payne helps parents reclaim for their children the space and freedom that all kids need for their attention to deepen and their individuality to flourish. 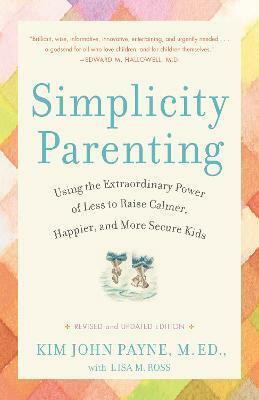 Simplicity Parenting offers inspiration, ideas, and a blueprint for change: - Streamline your home environment. Reduce the amount of toys, books, and clutter--as well as the lights, sounds, and general sensory overload. - Scale back on media and parental involvement. Manage your children's "screen time" to limit the endless deluge of information and stimulation. A manifesto for protecting the grace of childhood, Simplicity Parenting is an eloquent guide to bringing new rhythms to bear on the lifelong art of raising children. About Kim John Payne M.Ed. A consultant and trainer to more than sixty U.S. independent and public schools, Kim John Payne, M.Ed., has been a school counselor for eighteen years and a private family counselor-therapist for fifteen. Payne has worked extensively with the North American and U.K. Waldorf movements. He is currently project director of the Waldorf Collaborative Counseling Program at Antioch University New England, the director of a large research program on a drug-free approach to attention priority issues disorders, and a Partner of the Alliance for Childhood in Washington, D.C. He lives with his wife and two children in Harlemville, New York. Lisa M. Ross has been involved with books for more than twenty years, as an editor and literary agent, and now exclusively as a writer. She lives with her husband and two children in Stuyvesant, New York. From the Hardcover edition.